Add a recognizable and whimsical bluebird shelter to your bird garden with this Bird In Hand Chester County Outhouse Bird House. Mimicking a traditional outhouse, this reclaimed wood unit is sure to bring a delightful hint to your garden, while offering bluebirds a fun roosting spot. A 1.5" diameter entry hole allows bluebirds to access the home, and its tall design helps keep nestlings protected from predators. Its significant roof angles upward, keeping the nest dry and shaded, and furthering the outhouse motif. The hinged front panel opens easily for nest checks, and a metal, crescent moon accent here completes the look. Texture throughout the piece helps nestlings reach the entry when ready to fly, and the varied brown tones mesh with any garden. The deep grooves on the home are thanks to its "mushroom wood" construction, which is a blend of soft woods used in mushroom cultivation facilities. Attach a bracket (not included) to the shelter to place it on a pole or post, or use its attached eyehook to hang it. 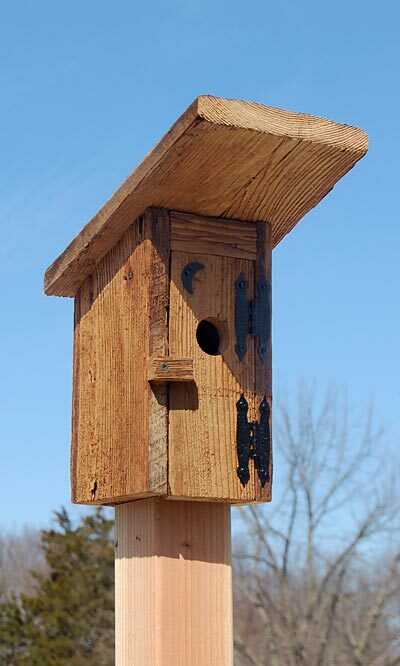 Offer bluebirds a private roosting spot with this Chester County Outhouse Bird House. Made in the USA.